How do you feel about giving your skin some TLC while you get some Zzz’s? Did you know that in the evening while your sleeping is the time that your skin repairs itself and preps for whatever the world is going to throw at it tomorrow? For this reason, your morning and evening skincare should not be one and the same (although they can certainly share a few steps and/or products). To give you (and your skin) a quick refresher on how to ensure your skin gets the detox, moisture, and minerals it needs before you get your beauty rest, I’ve compiled a quick cheat sheet of tips to make your nighttime skincare routine a breeze. 1. Prep Your Pillowcase - We spend so much time thinking about what we’re putting on and taking off of our face, that it can be easy to forget where we’re putting our face for a good 6-8 hours every night. You wouldn’t use the same washcloth to dry your face every day for a week, right? But I bet you may not think twice about using the same pillowcase for a week straight. Whether you’re a c-suite executive or a stay-at-home mom, we can all appreciate the beauty of some good multi-tasking. How do you feel about giving your skin some TLC while you get some Zzz’s? You already know that it’s important to cleanse your skin at the end of the day to wash away any contaminants (think dirt, pollutants, and bacteria) that may have made contact with your skin, but did you know in the evening while you're sleeping, is the time that your skin repairs itself and preps for whatever the world is going to throw at it tomorrow? For this reason, your morning and evening skincare routine should not be one and the same (although they can certainly share a few steps and/or products). If you’re already a few steps ahead of me and have your routine down pat, I’ve also recommended some natural products for your face, neck, and chest that you may want to switch out for your current go-to products. After all, the less chemical ingredients in your products, the more your skin will thank you in the long run! 2. Remove All Your Makeup — But Ditch the Wipes. While many of us may appreciate the convenience of makeup remover wipes, especially while traveling or on the go, they shouldn’t be your first option when it comes to removing makeup. Many makeup remover wipes don’t fully remove all makeup residue, and they can actually irritate your skin. Instead, try a natural makeup-remover option in liquid form. Not only will these penetrate your skin deeper and more effectively remove any makeup or dirt, they also ensure your skin isn’t irritated by any chemicals that shouldn’t be touching your beautiful face. 3. Don’t Neglect Your Neck (And Your Chest). With all this talk about makeup removal and washing your face, it can be easy to neglect the skin on your neck and chest. Here’s a tip: don’t! The sooner you start giving the same TLC to your neck and chest that you give to your face, the more you’ll thank yourself later. You apply daily SPF to your face, neck, and chest, so why not apply your other daily face products (think revitalizing creams, oils, and serums) to your neck and chest? The skin on the neck produces less oil than the rest of our body, especially as we get older. This can result in dehydrated skin that ages quicker than the skin on our face. 4. Incorporate an Oil — Even if You Have Oily Skin. Those of us with oily skin can benefit from a rejuvenating oil even more than those of us with dry or combination skin. Not only can oil help regulate oily skin, it’s also a miracle-worker for our skin as we age. The evening is the best time to apply a face oil so that your face can absorb the beneficial ingredients while you get some shut-eye. I particularly love our Nourishing Night Oil, which is made with all natural oils that reduce fine lines, wrinkles, and dark spots while also promoting new cellular growth. This oil is another great product to apply to your neck and chest as well, as it’ll moisturize the skin and stimulate circulation, therefore reducing signs of aging and wrinkles. If you’re not sure which oil is right for you, you may want to consider the benefits of particular natural oils listed in the ingredients. For example, here are some of the benefits of the different oils blended in the Nourishing Night Oil. 5. Invest in a Retinol - Wondering why everybody is so enamored with retinol? Well, Retinol is pure vitamin A and it solves skin problems for women of all ages — from acne and enlarged pores to drooping and dark circles. So, why’s it so magical? Well, the most potent retinol creams contain retinoic acid, an active form of Vitamin A that binds with our skin cell receptors, pushing them to behave younger and healthier. Results may vary, but they can include clearer, more “glowing” skin, a more even skin tone, smaller pores, smoother skin, increased collagen production, and decreased redness. While stronger retinols may bring quicker results, they can also result in dry and flaky skin before your skin adjusts to the Vitamin A — but don’t worry, this means you’re getting rid of dry, dead skin and unearthing the beautiful skin beneath! 6. If All Else Fails, At Least Use an Eye Serum. We’d all love to complete a 10-step skincare routine every night. Unfortunately, that’s not always realistic. That’s okay! The beauty of a nighttime skincare routine is that it’s personal, and you should do what works best for you, your lifestyle, and your skin. No matter your age, dermatologists agree that cleansing and putting on an eye serum or cream are the most essential steps for better skin. So, if you can only manage two steps each night, make it these two. If you’re in the market for an all-natural serum for the eyes, may I suggest this Hawaiian Luxury Under Eye Serum? Not only does it contain DMAE to tighten and tone the skin under your eyes, it also smells like a fresh bundle of roses! Regardless of what you end up using, dab (don’t rub) it on with your ring finger for minimal pressure as the skin under the eyes are very sensitive. If you’re going to only invest your time and money into one product though, make it count, make it a quality eye serum. Using quality, all-natural products free of harsh chemicals is key to healthy skin. The most important first step in improving your skin's health is reading the ingredients on every skin-care product you apply to your skin, especially any that are used daily (or nightly). Do you know what each of the ingredients are? Are they natural and safe? If what you find is a list of "chemicals" like Sodium lauryl sulfate, or Diaminobenzene, it's probably a safe bet this is not a product you want to apply to your skin nightly. Keep a watchful eye out for ominous catch-all items like "fragrances" or "preservatives." 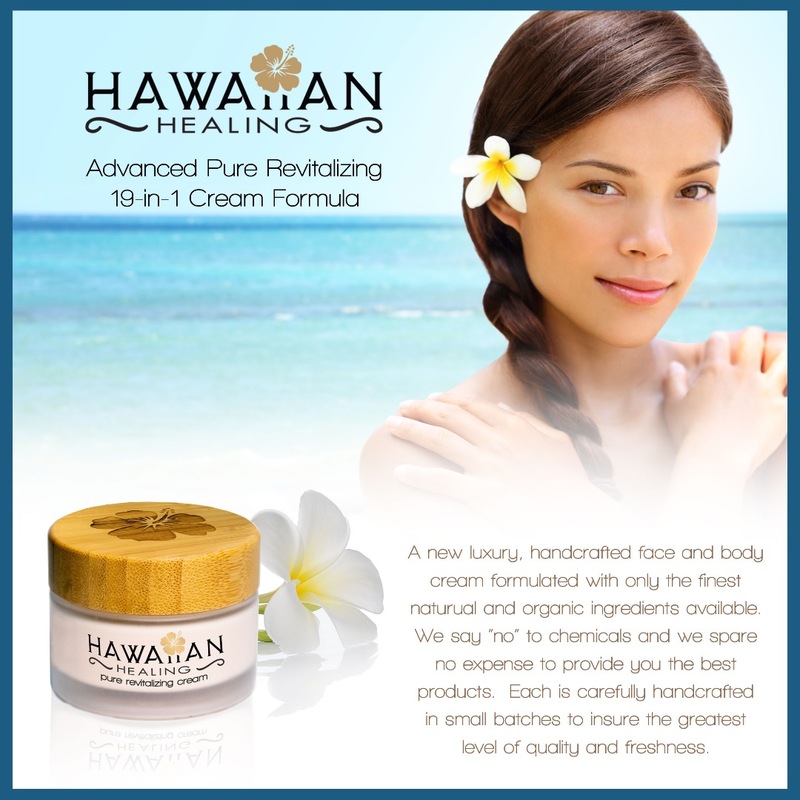 Hawaiian Healing Skin Care is focused on creating the highest quality products using 100% all-natural ingredients. NO petrochemicals, NO synthetic dyes or fragrances, and NO man-made preservatives. Our products contain only the freshest, all-natural ingredients mother nature has to offer. With a quality product, you use less, get better results, and have confidence that you're using fresh, all-natural ingredients. 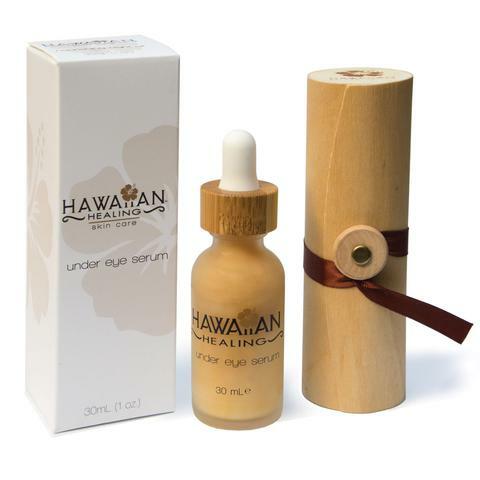 Hawaiian Healing has also simplified skincare down to 4 targeted products. Pure Revitalizing Skin and Body cream - A silky smooth, quick absorbing moisturizing cream designed to nourish and revitalize your skin. 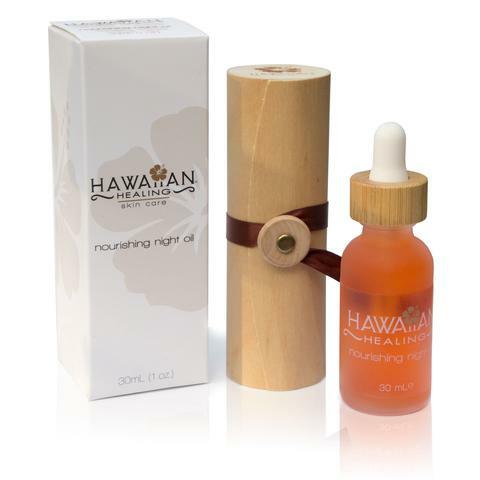 Nourishing Night Oil - A concentrated blend of quick absorbing natural oils that helps to replenish lost moisture and return elasticity to your skin while stimulating blood circulation and spawning new cell generation. Under Eye Serum - A light and velvety-soft organic, aloe-based formula that glides over your skin leaving it feeling nourished, healthy, hydrated and soft. 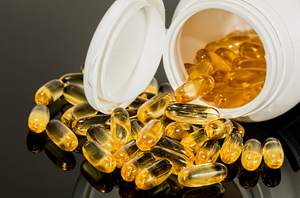 It's packed with the right balance of nutrients such as Hyaluronic Acid, Alpha hydroxy acids, Coenzyme Q10, ProVitamins A, B5, and B3. KioKio Coconut Beauty Bar - A naturally scented, coconut based, moisturizing soap with a creamy lather. Designed to soothe and soften your skin while moisturizing deeply. 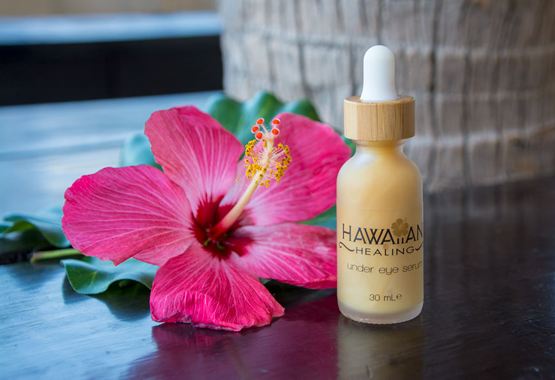 Where most brands are feverishly adding new products, Hawaiian Healing takes a different approach--adding only what is necessary. There is no need for 10 different creams, each for a different small area of the body. Simplicity and quality over quantity. Our newest night oil is extremely effective at reducing fine lines, wrinkles, and promoting new cellular growth. Using nightly helps to replenish lost moisture and return elasticity to your skin. A silky smooth, quick absorbing moisturizing cream designed to nourish and revitalize your skin. "This cream really does seem to super-nourish underneath my eyes and the fine lines that I have with a bit of crow’s feet and around my neck area. I’ve noticed the biggest difference with my crow’s feet. I love the texture and the way it leaves my skin silky smooth. Reading the ingredients, I am blown away by all the fantastic ingredients especially, the organic honey sourced from Hawaii. I can just imagine those bees collecting the honey from the macadamia tree flowers. I’ve used products that have manuka honey from New Zealand and this I feel is an even better product for my skin. Totally in love with this product!" - *Results may vary from person to person. "This was the very first item I ordered here, and I was really happy with the quality of the product. The packaging is just so special with a very classy glass and the bamboo lid is just amazing! I love the way it goes on and the fact that there is absolutely no greasy feel left behind. As others have mentioned, maybe the best thing about this was the scent. It just smells wonderful and not overpowering. It was like aromatherapy every day when I applied it. You don’t need to use that much and it covers very well. I can’t wait to try your other products like the nourishing night oil and I’ve heard there are soaps in the works." - *Results may vary from person to person. 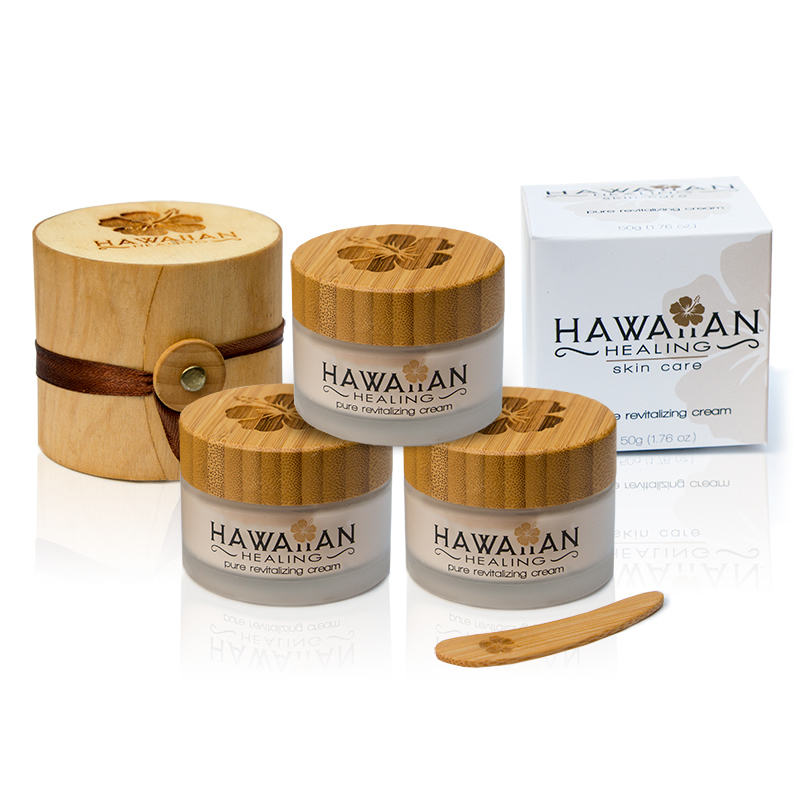 Try any of Hawaiian Healing Skin Care's products for 90 days and if you don't love them, you’ll get your money back! There’s absolutely no-risk in giving them a try. If you need to contact us with questions, feedback, testimonial or a suggestion, please send an email to info@hawaiianhealing.com. All emails are typically responded to within 24 to 48 hours, except weekends and holidays. Copyright © Hawaiian Healing Skincare. All rights reserved.